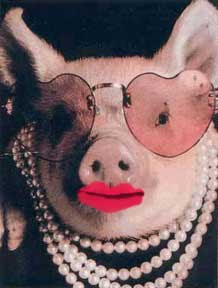 Putting lipstick on a pig-- is a slang rhetorical expression, used to convey the message that making superficial or cosmetic changes is a futile attempt to disguise the true nature of a product. This latest bruhaha "piggie-gate" I'm calling it, is so blatantly more of the same same same old b-s.
For all our readers and fellow Dems who are complaining thatObama-Biden are not coming out strong enough, this one is pretty damn good. I am also a fan of laughing at them first, then tearing them apart and finally bringing it back to what matters. We simply must not lose this election. Today after work I am cleaning up phone banking lists, setting up calls for this Sunday night AND doing a voter assistance table at a peace event (It is 9/11 already here in Japan.) I can't stand it any more.